Given their jaunty, buoyant debut album as well as modern music’s increasing trend toward upbeat synth pop, one might expect the Drums’ second album to take a further step in that direction. 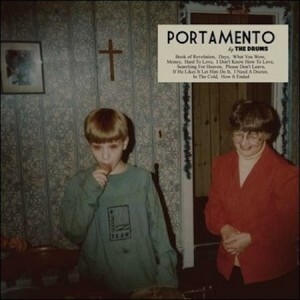 But vocalist/drummer Jonathan Pierce, guitarist Connor Hanwick, and bassist/keyboardist Jacob Graham throw us somewhat of a curveball on Portamento, the group’s follow up to their 2010 self-titled release. While Portamento definitely isn’t a complete turn-around from the Drums’ earlier sound, it achieves a more organic, sentimental feel, while still managing to preserve the upbeat vibe and catchy pop hooks. “Portamento” is a musical term originating from an Italian phrase meaning “carry the voice,” which is (possibly intentionally) quite apropos, as the vocal elements of the album are more embellished than on the band’s prior release. There’s a lot of “oohs” and “ahhs” here, but they’re a welcome addition to the backdrop of the swiftly strummed guitars, minimal synth flourishes, and uptempo drum beats. On the whole, the album is relatively conservative in its use of synths, but where they are employed, they serve as a nice complement to the music and avoid overpowering the mix. Portamento’s appeal lies in its on-the-surface simplicity and earnestness of both the music and underlying themes. The hooks and melodies are tighter and catchier than the band’s prior work, but the music feels genuine, rather than forced. “Days” begins with a smooth falsetto vocal melody, while bass and drums dominate the verse, creating a slightly somber tone perfect for Fall and the cold weather ahead. In contrast, “What You Were” bounces along with an uptempo beat and is skillfully supplemented with saxophone, channeling an 80’s soft rock vibe melded with more modern indie rock instrumentation. Lead single “Money” maintains the fast tempo, but achieves a darker, new wave feel, and is a great example of the Drums’ ability to use synth lines that complement the music, but manage to avoid feeling over-used. Ironically, “Searching for Heaven” may be the most synth heavy track on the record, and possibly the most downtrodden one as well. On tracks such as “I Need a Doctor” and the album closer “How It Ended,” Pierce flirts with more intimate and heartfelt themes. On the former, he sings “You’re like a child and I like that,” possibly displaying an astute fondness for youth and simplicity in an increasingly complex world. Overall, Portamento feels imbued with themes of love and loss, evoking a longing for purity and innocence. Although at times the album risks sounding generic, it manages to keep the listener’s attention with well-placed synths and vocal hooks. And while the whimsicality and fun-loving sentiments of the band’s older tunes aren’t quite as front and center, Portamento carves a slightly more distinct niche for the band, albeit one that wasn’t incredibly clear-cut to begin with.